Jarl Rognvald was one of the Norwegian chieftains that aligned with Harald Finehair (r. 860-940), the first king to spread his influence over all regions of Norway. The last vestige of Norwegian resistance against Harald’s rule was crushed in the Battle of Hafrsfjord, which was dated to have occurred in 872 by medieval historians, but now is believed to have taken place possibly as late as 900. Jarl Rognvald became one of Finehair’s staunchest and most powerful supporters, and the jarl was greatly rewarded for his loyalty. According to the Norwegian-Icelandic tradition, King Harald gave Rognvald control of North More, South More and Romsdal. In addition to that, Finehair also offered the jarl control of Orkney and Shetland after Rognvald’s son, Ivar, was killed during a campaign to claim those islands for Norway and to clear them of disloyal Vikings. Jarl Rognvald, however, was content with his land in Norway and decided to transfer control of Orkney and Shetland to his brother, Sigurd. Although Sigurd proved to be a capable leader, even expanding his territory into parts of Scotland, he unfortunately died of an infection. Sigurd’s sickly son, Guthorm, inherited control of the islands, but he, too, died after only a year. When Guthorm died childless, control of Orkney passed back to Jarl Rognvald of More. Yet, once again, he did not want to keep the lands for himself. This time, Rognvald decided to give the islands to one of his sons. At the time, the jarl was said to have had five living sons—Hrolf the Walker (who would become a duke of Normandy), Thorir, Hallad, Hrollaug and Einar. Rognvald eventually chose Hallad to become the new ruler of the islands. Hallad quickly became disillusioned in Orkney. Beleaguered by Viking raids and annoyed by local grumbling farmers, Hallad eventually grew homesick and returned to Norway, abandoning the islands. 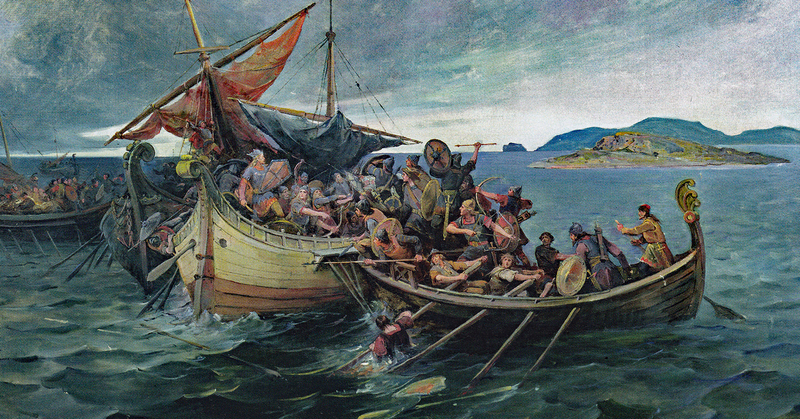 In his absence, Viking crews once more overran the region and the islands were virtually cut off from Norwegian control. According to the Orkneyinga Saga, two Vikings from Denmark took over the region. Their names were supposedly Thorir Tree-Beard and Kalf Scurvy, and they set up their main camp in Orkney. When Rognvald heard that Hallad had abandoned Orkney and that the region was now occupied by Vikings—Danish Vikings no less—the jarl became enraged and called a meeting with his sons (excluding Hallad). At the time, Hrolf the Walker was apparently away on an expedition, so only Thorir, Hrollaug and Einar spoke with their father. Rognvald was said to have undervalued Einar (his mother was allegedly a slave), so the jarl ignored him and asked only Thorir and Hrollaug which of them wanted to reclaim Orkney from the Vikings. When both sons dryly stated that they would follow their father’s wishes, but did not show much enthusiasm for the prospect, Einar stepped forward and confidently volunteered himself for the task. According to the sagas, Rognvald chose to accept Einar’s offer less as an acknowledgment of his son’s martial abilities and more as a way to get his unwanted son out of Norway. Whatever the case, Rognvald funded Einar’s expedition. Rognvald’s contributions, however, supposedly only bought a single ship and enough warriors to fill twenty benches. With his ship and crew, Einar sailed across the sea and made landfall in the Shetland Islands. There, he recruited more warriors and discovered that the Danish Viking leaders were still camped on Orkney. Armed with this information, Einar, his forces, and the recruits from Shetland sailed to the Orkney Islands and tracked down the Vikings. Proving himself a skilled tactician, Einar attacked his enemy and reportedly slew both Thorir Tree-beard and Kalf Scurvy with ease. With the Viking leaders defeated, Einar reclaimed the island territories for Norway and became the new jarl of the region. Although life was going well for Jarl Einar, he would eventually discover that the chaotic politics of the Norwegian royal family would pose much more potent danger than bands of Danish Vikings. According to Norwegian-Icelandic tradition, Harald Finehair had four sons with a beautiful woman named Snæfrid. She died an early death, and, after a period of mourning, the king supposedly came to believe that she had been a witch. Harald’s suspicion of Snæfrid quickly grew to encompass even her sons, prompting the king to send them away. The shunned sons understandably became quite disgruntled with their father. Like many unhappy children, the sons of Snæfrid unfortunately decided to do something scandalous to get their father’s attention. Hálfdan Hálegg and Gudrod Ljómi were two such sons of Snæfrid and Harald Finehair. According to the sagas, Hálfdan and Gudrod decided that the best way to draw the eye of their father was to kill one of his most trusted Jarls. With this in mind, the two brothers traveled to More and crept their way over to the hall of the local jarl. While everyone inside the building was asleep, Hálfdan and Gudrod set fire to the hall and murdered over sixty people. Among those burned alive was Jarl Rognvald, the father of Einar. When Harald Finehair heard of the killing, he was said to have launched a manhunt for his wayward sons. 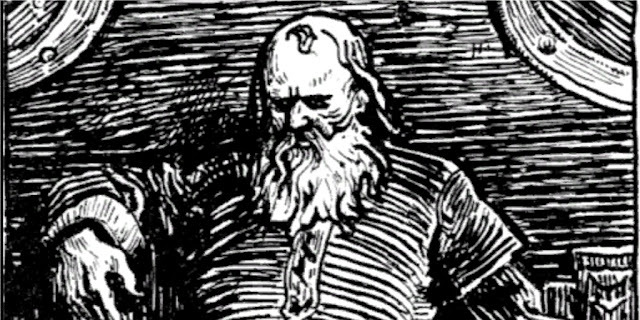 Gudrod Ljómi surrendered to Harald and reportedly suffered no major consequences for his actions—he mended his relationship with his father and eventually died at sea. Hálfdan Hálegg, however, fled from the Norwegian mainland with a fleet of three ships. Even though Gudrod and Hálfdan were not Harald Finehair’s favorite sons, the king tried to arbitrate a peace before a feud erupted between his children and the sons of Rognvald. As a first step, the king publicly gave support to Rognvald’s heir, Thorir, confirming him to be the new jarl of More. In addition, Harald arranged for his own daughter, Álof, to marry Jarl Thorir. Despite these moves by King Harald toward peace, a certain rogue son of his did not get the memo. According to the sagas, Hálfdan Hálegg and his three ships full of warriors sailed for the British Isles. Out of all the shorelines and islands that were available for a landing, his small fleet made landfall on the one group of islands where his presence would inevitably cause drama—Orkney. Jarl Einar still controlled the region, and even though his relationship with Rognvald had been strained, hearing that his father had been painfully burned alive inspired a new level of filial piety in the jarl. Despite his emotions, Jarl Einar was caught off guard by the sudden arrival of Hálfdan Hálegg. As his warriors disembarked from their ships, the rogue royal claimed the islands for himself and tried to use his status as a son of Harald Finehair to sway the locals to his side. Instead of facing Hálfdan unprepared, Jarl Einar decided to retreat to Scotland until he was ready to attack. Although Hálfdan Hálegg had forced Einar to flee Orkney, the jarl still had public support on his side. Since becoming ruler of Orkney, Einar had proven himself a capable military leader to his subjects. Additionally, he had a reputation for being able to solve problems—in this regard, he even became known as Turf-Einar after he encouraged people in timber-scarce regions to burn peat moss as a substitute for firewood. It also helped that Einar had the stature of a man that people would want to follow into battle. He was reportedly tall, strong, and had even lost an eye during a battle, leaving a scar that added to his fierce aura. With such respect from the people living in his domain, it did not take long for Einar to recruit an army with which to challenge his father’s killer. In less than a year after being forced to withdraw, Jarl Einar returned with a large army and attacked Hálfdan Hálegg near North Ronaldsay, a small island in the northeast of Orkney. The two forces battled until nightfall, at which point Hálfdan and his warriors scattered into the darkness. When morning arrived, Jarl Einar hunted down the survivors of the battle and captured Hálfdan alive. As punishment for the murder of Rognvald and the attempted usurpation of power in Orkney, Jarl Einar sentenced Hálfdan Hálegg to suffer one of the most brutal executions known to the Viking age—the “blood eagle.” The flesh on Halfdan’s back was cut lengthwise, his rib cage was pried open, and his lungs were pulled out and placed on his parted ribs so that his corpse looked like a bloodied bird. When news of the execution reached mainland Norway, it caused an uproar among the many, many brothers and half-brothers of Hálfdan. Even King Harald, who still wanted to end the feud, could not let the execution go unanswered. A king’s jarl just could not give the king’s son a gruesome blood eagle without any repercussions—it was a matter of principle. Therefore, King Harald Finehair reportedly gathered a large fleet and sailed for Orkney to remind Jarl Einar just who was the boss. When Einar saw the sails of an armada on the horizon, he panicked and fled to Scotland. King Harald, however, was still in a mood to negotiate. The two sent messengers to each other and a meeting was eventually arranged. After some typical haggling, King Harald offered to forgive Einar for the brutal execution of his wayward son in exchange for a fine of sixty marks of gold. The king even allowed Einar to extract the fee from the people of Orkney, if he was so inclined. In a genius, (albeit ruthless) political move, Einar presented the option to the people of Orkney, telling them that they could either pay the fee through unpleasant taxes or let their jarl take up the burden by paying the king’s fine with his own money. The people of Orkney, of course, chose the second option, but there was a catch—in exchange for saving his subjects from paying the king’s fine, Jarl Einar made the people of Orkney relinquished their allodial rights (the right to hold land without obligation to an overlord). After the execution of Hálfdan, and the fine imposed by Harald Finehair, Jarl Einar seemingly lived a relatively peaceful life. The sagas mention no more feuding or life-threatening warfare for the remainder of his days. According to the Orkneyinga Saga, he died naturally in his bed after a long reign. The Orkneyinga Saga and Heimskringla (History of the Kings of Norway), do not present a date for the death of the jarl, but Einar seemed to have died before Harald Finehair’s son, Eirik Bloodaxe, fled to the British Isles in the years after he was kicked out of Norway around 945. Picture Attribution: (Jomsvikings at the Battle of Svolder, by Nils Bergslien (1853–1928), [Public Domain] via Creative Commons). Heimskringla, by Snorri Sturluson and translated by Lee Hollander. Austin: University of Texas Press, 1964, 2018. Orkneyinga Saga, written anonymously approximately c. 1200, translated by Hermann Pálsson and Paul Edwards. New York: Penguin Classics, 1981.